Have you ever wondered what would happen if you plug an old iPhone charger half-way into the wall and then short the power prongs with the 30-pin connector? My seven year-old nephew did. Not surprisingly, iPhone chargers don’t handle 15-amp short circuits very well. The metal shielding of the 30-pin connector completed shorted the 120 V A/C power prongs. My nephew reports seeing a large spark, hearing a pop, and then witnessing a bit of smoke and funny smell. Fortunately, the 15-amp circuit breaker tripped almost immediately, preventing him from getting shocked and probably stopping a house fire. 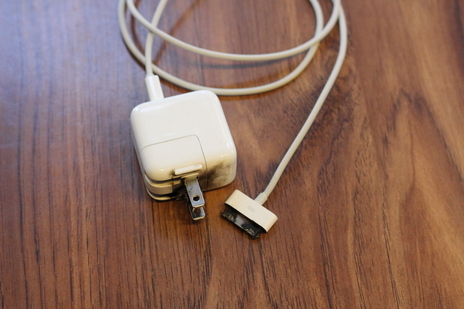 In the picture below, you can see the power prongs melted a bit, and there’s a coating of black soot all over the charger (the wall was dirty, too, I’m told). Lesson learned? We sure hope so!